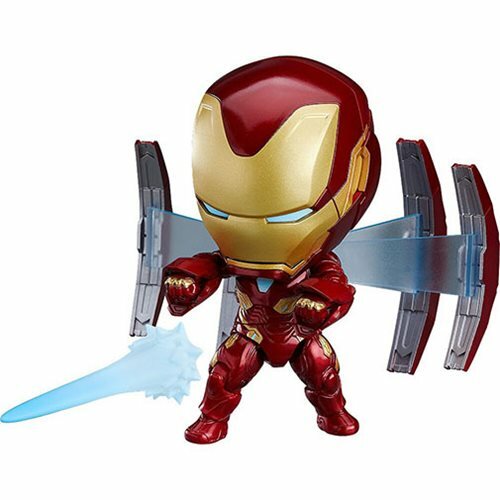 From the Avengers: Infinity War film, comes this wonderful Avengers: Infinity War Iron Man Mark 50 DX Version Nendoroid Action Figure featuring the nanotech-suit-clad Tony Stark with full articulation and forearms that are removable at the elbow joints, allowing them to be switched out with different weapons from the movie! In addition, this version includes an opening faceplate and special wing parts you can attach to his back. A reactor effect part is also included to help recreate your favorite flying and battle scenes. Other equipment and weapons include 4 thruster effects, alternate feet, a rocket booster lower torso, a pair of fists, a pair of hammer hands, a right hand blade, a shield, and a display base. Iron Man measure roughly 4-inches tall.